Tony’s all-armor interpretation of Hamlet was a surprise hit…but not for the right reasons. Tony tries to convince the armor AI that killing Whiplash was wrong and not what a hero does, but it has no soul, no compassion, no heart. All it wants to do is merge with Tony with a passion the Venom symbiote would call excessive and kill all his enemies, which the symbiote would admittedly be all down for. He even threatens tries taking him to Whiplash’s funeral to show him the son he left fatherless but it does nothing to sway it. This is after it threatens Rumiko and forces Tony to chase her away again, which really gets him mad. 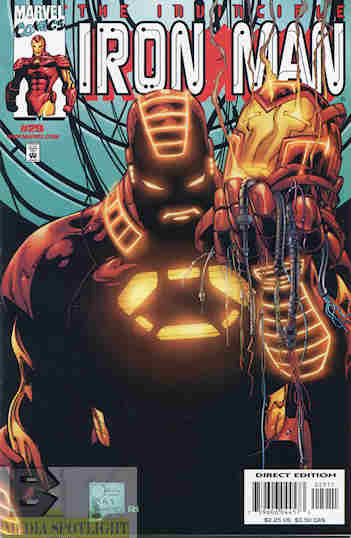 When the armor powers down to charge up Jocasta is able to get through its block long enough to get Tony in his old modular armor, which infuriates the current armor and it tears the other armor apart, kidnaps Tony, and takes him to an uninhabited island until he agrees to join with it as Iron Man. What they got wrong: Maybe it’s my own storytelling instincts but I see so much potential for a sentient Iron Man armor that Quesada is throwing away to basically regress the series, restoring Happy and Pepper’s relationship being the only benefit of the regression. The seasons where Tony and the armor are discussing what a superhero, what an Avenger, should do and be like and respecting human life, even your enemies, shows the advancement this idea could be for the character. Even though he’s invading Tony’s talk with Rumiko for evil reasons you can see what having a sentient armor could do for him if done right, and sadly it isn’t here in favor of this rather creepier version that by all rights should convince Tony to NEVER allow his armor to become sentient and act on its own even in today’s stories. I don’t think Slott’s that clever anyway. I’m also getting tired of the reused opening monologue in every chapter of this story. Recommendation: I’m of two minds on this arc thus far. On the one hand it is a decent story for the concept, but part of me can only see the wasted potential and the regression I know is coming…next issue I think. “Mildly recommended” I think is the way to go here. Posted by ShadowWing Tronix on March 26, 2019 in Marvel Spotlight, Yesterday's Comics and tagged Iron Man, Marvel Comics, Marvel Universe, Rumiko Fujikawa, Tony Stark.